Welcome to our online cross stitch & needlework supply store. We are dedicated to all things to do with cross stitch & needlework, and we hope to share our passion with you. We are based in Canterbury, just north of Rangiora, and are ONLY online so we can usually offer cheaper prices as we don’t have the overheads that a shop does. StitchNZ began in 2000 with nine patterns and no Internet. It has grown from that small beginning and has faced a number of challenges as the Internet has grown. The Christchurch earthquake was a particularly interesting time. Elizabeth took over in 2013 and has put her own stamp on the business. 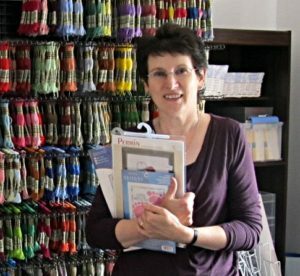 She has been doing Cross Stitch and embroidery for almost 30 years and is delighted to be working daily with products that she loves. Our aim is to keep this web site as easy as possible to negotiate, and to provide a happy one-stop and safe online shopping experience for you. These days you can source patterns & charts from almost anywhere in the world so let us help you find the perfect fabric, threads and accessories that you need to complete your projects. You are welcome to make suggestions on what you would like us to stock – just use the Contact Us https://www.stitchnz.co.nz/contact-us button. Any questions you have are also very welcome. Our site is still growing and we will continue to expand our selection of cross stitch & needlework supplies – so please check with us frequently to see what we have recently added.